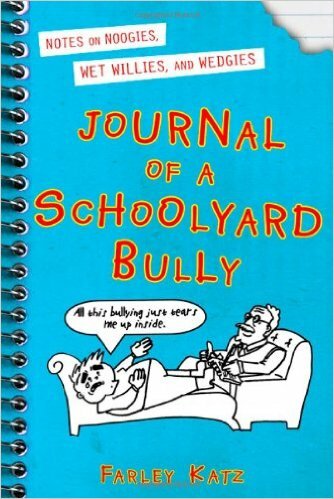 I received Journal of a Schoolyard Bully by Farley Katz through the Goodreads Firstreads program. The font was fun and the illustrations were well done. Unfortunately that’s pretty much the extent of the positive things I have to say about this book. I’d really like to know what the author was thinking when he wrote this. Mr. Katz, who is the youngest staff cartooner for The New Yorker, clearly has talent but this book is certainly not evidence of it. I will say that it seems to be a pretty accurate portrayal of a middle school bully’s journal. Which means that almost all of it is dull, the bully has no redeeming qualities and takes no responsibility for anything. The author touches briefly on some personal issues the bully has, which are likely the cause for his bully behavior, but sadly these are dealt with just long enough to give you a sliver of an idea of what the kid is actually thinking. Then he just goes back to being a little jerk. I certainly wasn’t expecting the bully to be 100% reformed by the end of the book, with tons of new friends who’d forgiven his former bully ways and a ticker-tape parade in his honor, but I did expect that he’d see the light to an extent and that he’d go through some kind of personal growth process. Nope. The book is just a bunch of examples of him bullying kids, tricking the psychologist he’s required to see and just generally a story about a kid who’s a big jerk. You’d imagine that this book, which clearly borrows plenty from Diary of a Wimpy Kid, would be geared towards a young adult audience. Maybe it is, I actually don’t have a clue, but it seems that some of the vocabulary in this book is well above what a supposed middle school bully would use and certainly I wouldn’t be comfortable with my 7th grader reading an account of a unrepentant bully. Overall, it was visually pleasing and this is an author who clearly has promise. I just really don’t understand what he was trying to accomplish with this book. This entry was posted in book reviews, fiction and tagged book review, fiction, katz. Bookmark the permalink.